For many artists, a performance of one of Schubert’s song cycles is something to prepare for and then recover from. The daunting task of performing two-dozen varied and intensely dramatic songs in an unbroken span requires physical stamina as much as uncommon vocal technique and interpretive depth. 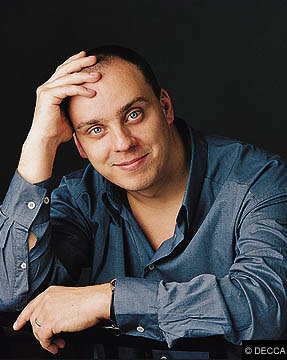 Starting Monday at Ravinia, Matthias Goerne will tackle not one, not two, but all three Schubert song cycles with Christoph Eschenbach at the keyboard. The 42-year-old German baritone will kick off the Schubert marathon at the Martin Theatre with Die schone Mullerin, continuing Wednesday with Winterreise, and concluding on Friday with Schwanengesang. If that’s not enough vocal heavy lifting, Goerne will cap the week performing Viennese music with Eschenbach conducting the Chicago Symphony Orchestra on Sunday. Some see Die schone Mullerin and Winterreise as two sides of the same coin. The first tells of the happy, rustic country lad who realizes that his beloved, the beautiful miller maid, has found another lover, and his resultant anger, devastation and ultimate suicide— a more youthful spring version of the interior winter journey of Winterreise. Assembled by Schubert’s publisher years after his death, Schwanengesang does not offer a cohesive dramatic arc, as with the two earlier cycles. But it contains several Schubert masterpieces—Standchen, Der Atlas, Der Doppelganger—and Goerne belives that Schubert’s “swan song” is no less a valid artistic experience. Having performed the Schubert song cycles all over the world, Goerne is always struck by the reaction that this deeply personal yet universal music has on audiences, even when they do not understand a word of the German texts. Matthias Goerne and Christoph Eschenbach perform Schubert’s Die schone Mullerin 8 p.m. Monday at Ravinia’s Martin Theatre, Winterreise 8 p.m. Wednesday, and Schwanengesang 8 p.m. Friday. Friday’s concert also includes the Schubert Piano Sonata in B-flat major, D.960. Goerne will also perform August 2 in a Viennese program with Eschenbach conducting the Chicago Symphony Orchestra. www.ravinia.org; 847 266-5100.